-Do not earn extra event currency over freemium characters, and not necessary to complete event. I like them. They’re cute and festive, but by no means are they necessary for this event. I wouldn’t purchase them for the event currency aspect, I got them because they make me smile & their spread cheer task is great! If you like them, grab them. But if you’d rather spend your donuts on full chracters pass. I’d pass on this duo. Save your donuts for new characters, and if you still have some left towards the end of the event & you like them pick them up. But for now I’d pass, they’re not necssary for the event. 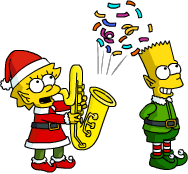 What are your thoughts on Elf Bart & Elf Lisa? Will you be spending the donuts to bring them to your Springfield? Did you already? Why or why not? Sound off in the comments below, you know we love hearing from you! This entry was posted in Characters, Tips and Tricks, Updates and tagged Elf Bart and Elf Lisa Questline, Elf Bart Tasks, Elf Lisa Tasks, Rigellian Christmas, Should I Buy Elf Bart, Should I Buy Elf Lisa, Tapped Out Christmas Event, Tapped Out Kang and Kodos Christmas, Tapped Out Tips and Tricks, The Simpsons Tapped Out, TSTO Addicts, TSTO Alien Invasion Event, TSTO Christmas 2017, TSTO Tips and Tricks, TSTO Winter Event 2017. Bookmark the permalink. I think EA should give a refund on this because they do not earn event currency like they stated. I bought these skins in Act 1 knowing no event currency until Act 2 and knowing you don’t need the event currency to complete Act 2 (already 2 1/2 days ahead of event calendar)….. and because I love to have as many Christmas skins in my town during Christmas time as possible. But it is a little frustrating when the push event currency as a selling point and don’t give it. I was hoping for this event currency to either help with extra crafting for the Bonuts after I complete the event…..hopefully it will kick in by the time I finish the event and before the event ends. I saw Gil’s offer this morning, I passed because I was just waking up and wanted to wait. Now I have gone back into the game and no Gil and no Jesus! I have scrolled back and forth as Alissa suggested but nada, nothing, nowhere to be found. Anyone else with this problem? Whooooops! Never mind. Found it. Scrolling is your friend. Same thing here, but… I think you’re scrolling on the wrong screen. Go to the window with “The Store”, and he should be hiding to the right of the Mystery Box. Me too. Gil disappeared after I went buy more donuts. Oh, I found him! Thank you “O”? I have Bartman and Lizard Queen Lisa, and those are what they generally live in. Actually, they both have so many costumes there’s no way I would spend donuts for more. I bought these during Act 1. I am a premium player and it was a no-brainer for me because when I picked them up the description said “earns event currency.” Now the characters don’t? While I like the characters, I think that stinks on EA’s part to mislead. I know I should have come here first or waited for the “should I buy” analysis, but they were so neat. 😊. It really makes me nervous about spending donuts in the future. I would be great if you could place your characters where you wanted. The cuteness level of Jesus’ task on the swing is off the charts. I’m on the fence with this one. I was waiting for the SIB to see If I could be persuaded but I remain on the fence. Nice costumes but are they worth 100 donuts? I don’t think so. Exactly! I bought him straight away. Love the character, love the swing/escalator combo, love the dialogue, love the tasks. It’s one of the best buys ever in my opinion. I was saving up for Jesus, didn’t see him in act two, and then bought the synagogue! Ugh! Now I only have 93 donuts left and hope to be able to farm enough. But I only saw Gil pop up last night, and can’t find Jesus ( oh the religious jokes here!) will he make a second coming?!! I’ll make this easy… yes and yes. If you have Buddha you need the rest of the power trio roaming your town for good luck. Jesus….199 donuts. Too much for me even if it is Jesus. Hopefully he may come back at Easter at a discount !!! I’ve been saying since the event started….save 200 donuts for Jesus. Yeah I know Alissa, still way over the top though for a character, Jesus or not. It’s a character and a hilarious decoration. Trust me on this. This is one of the funniest, most clever things they have done for a while. And…this is coming from a CrankyOldGuy! @The Dog I agree. I think it’s way too high for a minor Simpsons character. I have to say, this is the first Christmas event where I’ve wanted it all (well with the exception of the very first so many years ago)! I’m one of those kinda freemium, kinda premium players & I’ll admit I’ve done some KEM farming, bloodmobile purchases & dropped some real cash this event. I’m more of a Halloween event fan but this year EA has knocked it out of the park & I’m loving everything about this Christmas event!! I got Bart & Lisa in act 1, don’t regret it a single bit! Boom! Now that’s what I call a Happy Tapper! You will not be the only one who had spent real money on this event. EA are no mugs, they know folks will want all this Christmas stuff & not everyone farms. At least Santa is free ….. hooray !!! Dear EA. I would buy skins. All of the skins. Except every time there is a “send springfielders” task they’ve all changed out of their skins. If this changed I would buy so very very many skins!